The horn plates covering the body of the Gladiator Dragon can be re-configured at will to form real armor for their bearer. Thanks to this shell, the Gladiator Dragon is virtually invulnerable to the claws and fangs of other predators. How to Breed Gladiator Dragon? 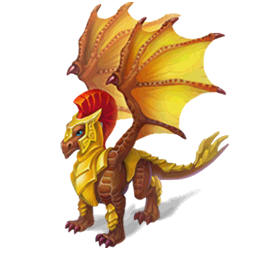 Find out how to breed Gladiator dragon with the How to Breed Calculator! We've update the feed cost, health after the Armor Update! Increases the speed at which the dragon earns gold. Decreases the amount of food required to feed the dragon. The higher your dragon"s rank, the greater its health and the more damage it can inflict. Questions, Comments, Suggestions? Let Us Know!